I grew up on the Eastside of L.A., so my first impressions of graffiti were from K2S/STN crews. 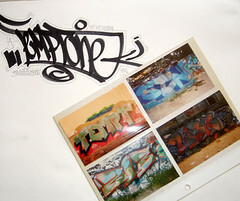 Artists like Cash, Skept, Defer, Relic, Geo (rip) were my first influences as to what graff was all about. Among these dope pioneers, Tempt was one of my favorites. First off his color combos were always sick. His lines always crisp and his handstyles always flowing. Around that time when I first started messing with writing, we found out that Tempt was working at a small hobby/stationary store in Monterey Park's, Atlantic Square. So we would go there and try to rap with him on the DL. (It wasn't cool back in the day to openly jock someone..) So we would go in there and try to jack some testors off those Odds n Ends cans or whatever. We thought he had the best gig in the world. A writer working at a shop that sells markers and paint...thats the life! I first met him, officially, while buying some paint at Standard Brands. He was with Cab and Stans. I remember I was so nervous just to be in this guys presence. His throwups were simple and clean. That capital "T!" was up everywhere on the streets and on the freeways (with FB). I was lucky enough to be in a few shows with him, namely at MOCA in '94. He's always been a cool cat. Really intelligent and well spoken. Check out Graffiti Verite, he's got some great quotes in that documentary. He's always led by example. 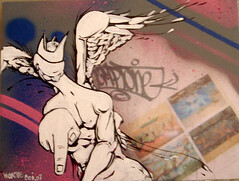 We were lucky enough to have some original Tempt pieces in some of our early shows at Crewest. This was his piece he did from our first CANCEPTUAL show in '02. It was a big blow when we found out that he had been diagnosed with A.L.S.. I remember him coming down to Crewest in 2003, to participate in Eyeone's Lost v2 exhibit. His hands were already being affected by his condition, but like a true warrior he fought through it and busted out some fresh handstyles that were posted up on the front window display. They took him longer than usual to produce but he knocked them out in style. It's always hard to see one of your heroes being affected by illness in this way, it's very humbling to say the least. So after I found out that there was going to be a benefit show to help him and his family out through these tough times, I was instantly down to participate. I'm very proud to be able to donate some artwork to benefit him and his family. This is the artwork I created using some of his imagery and one of my characters. Its a small canvas but I hope it sells and helps raise money for Tempt.